Charlotte and Gordon StowellJust 8cm square and 2cm thick, these colourful and sturdyboard books are perfect for little hands. Each one featuressimple text and lively illustrations that teach toddlers howGodshowshisloveforthem.FromCandleBooks. 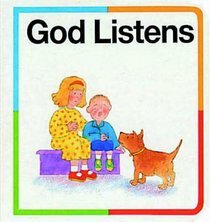 About "Bible Block Book: God Listens"
This title is part of a series of bible books based on morning service talks. Gordon Stowell is a published author, designer, and an illustrator of children's books. Charlotte Stowell is an experienced freelance illustrator and model maker working in a wide variety of techniques and styles. Work includes editorial illustration, character illustration, craft, educational and step-by-step work.